Music can create forms of communication that persist long after the music has stopped. 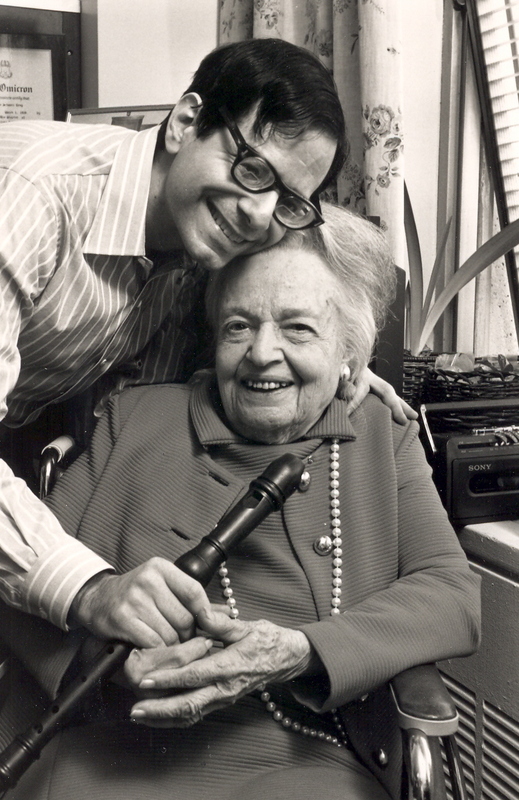 Before I became a music therapist I volunteered for Dorot, an organization that served elderly people in New York City. They would send “friendly visitors” as companions to their clients who requested it. Unfortunately, friendly visitors were not appropriate for everyone who wanted one, particularly if the person making the request could not hold a normal conversation. Since I had already been exploring the use of music to reach such people, when the organization had such a client, they would call on me. They told me about Blanche. Blanche loved to talk, but they couldn’t send her a friendly visitor. Her speech was often unfocused, and she had a tendency to ramble. But she so much loved company. Would I go to see her? I found Blanche’s apartment in an old building on Manhattan’s Upper West Side. It was quite spacious, with plenty of sunlight. Lots of room for a musician to spread out, which I appreciated: I was carrying my recorders, music stand, and lots of music. (For those who may not be familiar, a “recorder” is an early type of wooden flute, most commonly used in music before 1800.) And there sat Blanche in a large comfortable chair in the middle of her sitting room. She was in wonderful spirits, so happy to talk of music to anyone who would show an interest. Such a delightful lady, I thought, and still had to wonder why they wouldn’t send her a friendly visitor. Then Blanche asked me if I played in an orchestra. I explained that the recorder is not an orchestral instrument; it is just a simple wooden flute whose sound is too soft to compete with the modern orchestral instruments of today. She still asked the question several times, and offered suggestions for joining orchestras or chamber groups. Her speech seemed disconnected from mine. She would answer none of my questions directly, instead using them as a springboard for lengthy recollections of what she had done before in her life. And her life interested me greatly, as a fellow musician. She taught the violin, or the “fiddle” as she affectionately called it. Her students were among the best, including William Schuman, the famous American composer. She loved teaching and she loved her students, and took great pleasure from revisiting her past. I still have a framed picture of her presenting a Public Service Award to Jack Benny on behalf of the American String Teachers Association. Over the next several months I too became her student. Blanche would listen to my flute playing and offer suggestions about how to play more expressively. But the odd thing was she spoke to me as if I were a fiddle player. She asked me what orchestras I played with, and seemed not to understand when I tried to explain that the recorder is not an orchestral instrument and would be easily overwhelmed by the large orchestras of today. She would give me violin instructions, like “downbow” and “upbow,” and she would mention other string players whom she wanted me to meet and play with. “Fiddling” on the recorder was OK with me. By becoming her student, I let Blanche relive some of the best moments of her past. She loved it when I told her that her suggestions were helpful. She was once again the teacher she had been in her prime. I had not seen Blanche for about two months, when one day I was riding the bus and someone I barely remembered recognized me. It was her housekeeper. She told me that something had happened to Blanche, and that I should come and see her. When I got there the next morning I found Blanche still in bed. She had a special hospital bed with guard rails on the sides. The housekeeper and another woman helped her out of the bed and put her in a wheelchair. I had never seen her in a wheelchair before: she always used to sit in her big easy chair that reminded me of a throne. I was surprised by the agitation in the housekeeper’s voice. She told me that Blanche had begun to deteriorate markedly during the previous two weeks. She said Blanche often hallucinates: about teaching former students, about frantically searching for her lecture notes or preparing for a class. She asked me to help get her transferred to a nursing home. Blanche recognized me at once. At first she seemed in her usual good spirits. She complimented me on my playing, and shared some insights about teaching violin students. I played several pieces for her. Her emotional changes startled me: when we talked in between the pieces she was rather jovial, happy to be the teacher. But during the music itself she seemed very sad, at times even crying. I had never seen her react this way before. Toward the end of the visit I saw evidence of her hallucinating. She commented on some birds she saw flying, and told the housekeeper to give them birdseed. The housekeeper gave me a funny look. I looked carefully around the room, and the only bird in evidence was a miniature plastic pigeon in a flower pot. There was increasing talk about placing her in a nursing home. I became acquainted with Eleanor, a piano teacher and friend of Blanche’s, who had Blanche’s power of attorney and was taking care of her affairs. Together we worked to help transfer Blanche into a nursing home not far from where she lived. While Eleanor had a lot of affection for Blanche, she herself did not live close, and she also had a busy teaching schedule. Not wanting Blanche to feel abandoned, she asked me to visit regularly. The first time I saw Blanche in the nursing home, I found her extremely depressed, quite a contrast from her former, very consistent cheerfulness. Now in a wheelchair she could not move herself, she told me she felt like a prisoner. She couldn’t let go of the hope of one day returning to her apartment, although I knew that would never happen. In those early days in the nursing home Blanche was mentally alert but her depression continued. She was mourning the loss not only of her home but of her freedom. Now she was at the mercy of others for even the most basic necessities of life. It particularly stung when a nurse would balk when Blanche asked to be taken to the toilet, snapping that she didn’t have time to be bothered. Blanche told me that the nurses had subtle but effective ways of retaliating: like asking her if she wanted something, then leaving her in her room without doing anything about it. I had only her word on those incidents, but one day I did notice fresh bruises on her legs, which she said she got when she tried to get back into bed by herself after an attendant had refused to take her. A complaint was made, and the attendant was replaced. After about three months Blanche’s good spirits began to return. She was getting past her phase of adjustment to her new surroundings. Relations with the staff also improved, and many became quite fond of her. She rekindled her enthusiasm for music, and always asked me to play. She delighted in showing me how she had fixed up her room. She was especially proud of a framed picture on the wall of her giving a presentation to Jack Benny (the picture that I now have). She assured me that contrary to popular opinion, Mr. Benny could actually play the violin quite well. I could see that she had finally adjusted when her 93rd birthday arrived. Eleanor arranged a party for her at the nursing home, inviting many of her old friends and former students. One of them baked a delicious chocolate cake, topped with a huge “93” and three candles that Blanche managed to blow out. Blanche was radiant in a gorgeous red dress and a new string of pearls that Eleanor had bought. She was once again the queen of the salon. For many days afterward Blanche remembered that party. She loved to talk about it, and to entertain me with funny stories about her former students. Over those many days her hearing began to fail (or so it seemed), and I began having to repeat myself quite a bit. Still, her mood was not affected. She had made herself quite at home, decorating her half of the room with pictures and other mementos. She could no longer walk on her own, not even with a walker, but still her attitude kept her perhaps the healthiest resident on her floor. I continued to see signs of Blanche’s successful adjustment to the home. One day I found her in particularly good spirits, thoroughly enjoying a book about the violinist Nathan Milstein. Blanche had just gotten a new roommate, a very frail and sick woman who could not move at all on her own. She just lay on a bed with special protective sides. She could not take care of her own needs and had to be changed regularly by a nurse. I wondered whether having such a roommate would affect Blanche’s spirits. At the end of the visit, I got my answer. When I reached the lobby after I left, I remembered that I had forgotten a package in Blanche’s room. When I went back to the room to pick it up, I saw that Blanche had wheeled herself up to the roommate’s bedside and was speaking to her very soothingly. She didn’t even notice as I slowly tiptoed out. Blanche’s hearing seemed to be getting worse. I needed even more to repeat myself in order for her to understand me. I would ask her a question and she’d seem not to notice; she would just go on talking about the same thing. But strangely enough, she seemed to have no trouble hearing my music. Her 94th birthday came with another party hosted by Eleanor. We had fewer people than the previous year, and Blanche was not quite as lively. Still, her usual good humor was very much in evidence. But a couple of months later one could no longer mistake the changes. Blanche could not remember my name now, although she still knew who I was. She rambled incoherently. I couldn’t understand what she was saying, and so had to reassure her with my presence rather than with my words. I realized now that what seemed to be hearing loss was really a sign of her advancing dementia. Blanche was now frequently incontinent. I arrived one day to find her struggling to put on a diaper. She succeeded only in increasing her frustration, until an impatient nurse finally came to help her. Another time I found her compulsively fiddling with her dress, repeatedly putting it on and taking it off. A nurse told me she does this all the time now. The odors from her incontinence were also very noticeable. I was able to attend a meeting with the physician responsible for her care. He told me Blanche was suffering from a progressive atrophy of the brain due to multiple strokes. I could no longer communicate with her verbally, so the only thing left to try was music. I told her we were going to have a concert. This delighted her. She was able to compliment me on my playing - now for her an unusual feat of verbal self-expression. She almost seemed like the old Blanche. But she would go off to different times and places. She spoke often of inviting people and making plans for my wedding (I was getting married that spring, but was sure I hadn’t mentioned it to her!). Her spirits were better than I had seen in a while - and all because once again she was hearing live music! Finally her 95th birthday arrived, the last one we would celebrate together. Once again Eleanor made the preparations. Again some of Blanche’s friends and former students attended. A woman who had studied with her since the age of 12 played a violin/viola duet with her husband, the concertmaster of the Rhode Island Symphony. Afterwards I joined him on my flute for “Happy Birthday.” The couple’s six-year-old daughter, who was just starting the violin, also played, and a delighted Blanche complimented her technique. After an absence of four months, I went to see Blanche once again. I found her sitting in a wheelchair opposite the nurses station - and I didn’t recognize her. Her face was discolored, and she had lost a couple of front teeth as well as a lot of weight. I found out she had been sick with a number of infections she had caught in a hospital emergency room, and had not eaten normally for three weeks. After that she had a nasty fall, damaging her nose and teeth and bruising her face rather badly. Her dementia was getting worse. The nurses did not want her alone in her room because she would grab things randomly and scatter them all around. She seemed so lonely - once she had someone to talk to she would babble incessantly, most of it totally incoherent. In spite of everything music still connected us. When I began to play I saw a new light come to her face. All during my playing she would say what a joy music was for her. Her good spirits continued to shine through the notes. But when she was alone the troubles returned. The nurses told me she would scream so loudly that people could hear her all the way to the end of the long hall. They kept her in a special wheelchair with a lapboard secured in front of her to restrain her. They also gave her heavily sedating medication. As Blanche’s brain continued to atrophy, the nature of our communication changed. As soon as I would step off the elevator I would hear her start to scream and pound her fists on the lapboard. Her excitement surprised me. She would take my hand in both of hers and kiss it. Once she managed to say, “I’m so glad you’re here! I love you!” But most of the time words escaped her. One time Blanche was flat on her back in bed with fever, but she still perked up when she saw me. I played my flute at her bedside, and still she grabbed my shirt, wrestling with me, refusing to let go. There was desperation in her face. Here at the lowest level of her deterioration, I felt we were more intimately connected than ever. Words could not have told me more clearly what she needed. Blanche died a few days later. Some time afterward, her friends came back to remember. I played my flute at her gravesite.